Baron Roland Vesli looks forward to a modest Yule until he receives a troubling missive. Someone in London wants his beloved sister Amée dead, and his father is sending her to him for protection. For her own reasons, Elysande de Souredeval is content to abandon the glittering court of King William to accompany her friend Amée into the wilds of Eastsæxe. Their flight is discovered and peril follows, but an unexpected danger – to her heart – awaits in the quiet manor house to which she flees. 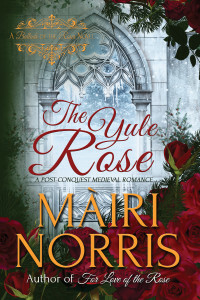 An unexpected snowstorm, a merry but exasperating sister, a determined killer and a beautiful, troubled woman who captures his heart with the first look all conspire to turn Roland’s sedate country Yuletide upside down.